LOS ANGELES-Former Taiwan President Lee Teng-hui urged the United States and other democratic nations Friday to be on alert as China grows in economic strength and not to tolerate its aggression. “Free nations must develop and strengthen their global and regional cooperation in both supporting the people of China in their struggle for freedom and democracy as well as taking measures to stop Chinese acts of oppression and aggression,” Lee said. 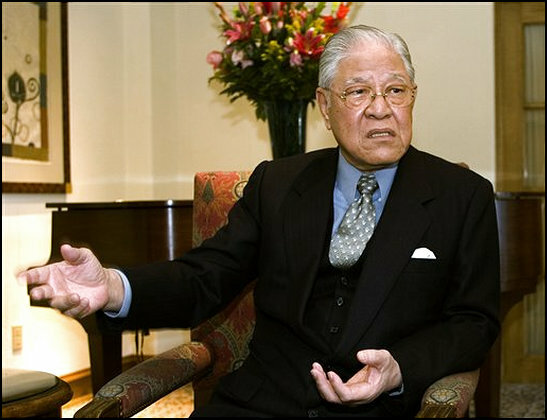 Lee, credited with bringing democracy to Taiwan in the 1990s, spoke at an event sponsored by the Formosa Foundation, a Los Angeles-based nonprofit dedicated to democracy in Taiwan. His prepared comments were translated into English and distributed to reporters. Taiwan, 100 miles off China’s southern coast, has been resisting Beijing’s rule since the Communists took over the mainland in 1949. The island has had de facto independence for more than 50 years, largely because of its U.S. support. Lee has advocated for world recognition of Taiwan as a sovereign nation.